Seven days ago [Japan] did not exist. Seven days ago [Tokyo] did not exist. Seven days ago [Shibuya] did not exist. There was no Tokyo Midtown. There was no Meiji Shrine. There was no Tokyo National Museum. Seven days ago [it] was all born. Jean Baudrillard, a French philosopher and sociologist, controversially theorized that the “Gulf War did not place.” An angry public clamored at the preposterously ridiculous claim that a war that claimed thousands of lives never existed. Baudrillard digressed, stating that it was a “media image-driven” war, not a “genuine” war. People read about it and saw images of it everyday during the course of the war but war was not their reality, per se. The war only existed in their minds as a result of the images and stories they had heard. This is what Tokyo was to me. I see this type of mental-detachment in Tokyo, particularly on the subways, where a majority of its riders are tuned in to their phones, listening to music or watching television. Could they have the same manufactured view of America that I had of Tokyo before coming here? Quite possibly, especially when you consider that media-driven technology in Tokyo is exponentially more influential than in the U.S. You are not experiencing the flooding in Pakistan being reported on by CNN. You don’t see the flood water around you or feel the grip of thirst that you feel if you were actually there. What is “real” mean to you? Is it something that you have to touch? Or is it something that you have to see with your own eyes, in front of you? You see thousands of images sequentially whenever you watch television or surf the internet, but you are only engaging one, if only two of your senses (sight and sound). You may have read about Michelangelo or seen pictures of his paintings, but without visiting it, could you tell me what it smells like inside the Sistine Chapel? How it would feel to gently press your fingers against the Pieta? To me, if you are not engaging all of your senses, in addition to your intellect, how can anything become real and have legitimate qualities? Tokyo did not exist seven days ago. Tokyo was born when I first stepped off the bus at our hotel, the humid air pelting my body, gazing at the countless lights of the city. Tokyo was born when I touched the concrete of a Tadao Ando building, in all its liquidity-looking perfection. Tokyo was born when I tasted and smelled my first bowl of Japanese ramen. Tokyo was born when I heard the hum of the Japan Rail train jetting out of the station. Seven days ago Tokyo was born and every time I discover something new here, I can feel the city breathing, it’s chest heaving. This city represents a plethora of realities that are all intertwined and that constantly bustle and brush past one another but never stop. People sit quietly on the subway, staying to themselves. People are in their own world: disengaged and isolated. Isolated in a city of 13 million people? The janitor who rides up and down the buildings elevators to clean the railings does not share the same reality of the businessman who rides the elevator to get to his office building high in the sky. As a tourist and foreigner, I have a completely different understanding of the Tokyo Midtown project than the resident of the service-apartments there who frequents it’s shopping areas every day. Do you have any perception of the reality of a coal miner or a biology professor? If no, why not? There doesn’t seem to be any interaction en route, unless you’re with a friend or in a group. The journey does not hold the same value as the destination. However, these “destination nodes” are littered across the city, where people suddenly discover and experience with their senses, whether they taste a new alley food in Ginza or hear some new J-pop music in Harajuku. Each new finding adds to the reality of this city and is where individual realities stop being isolated and become shared. I observed this at a park outside of the Tokyo National Museum, when a group of Japanese guys, slicked back in ‘60’s American greaser attire, gathered around a boom box and danced. Just to dance. 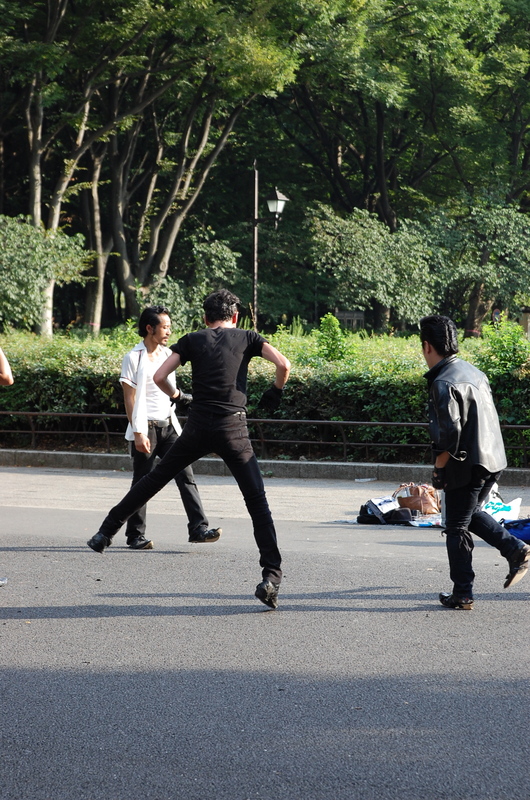 It was 95 degrees out and humid and these guys were in leather jackets dancing like there was no tomorrow. Tokyo has become real to me because I have experienced it with all my senses. One can make the argument that much of what makes of Tokyo is manufactured, making it less real. One instance of this is the manufacturing of wax food in restaurant display windows. There is an entire industry devoted to the making of fake food. But that does not change the fact that people still inevitably eat the real food that the restaurant is selling. If you are able to experience something using the full extent of senses, as well as tying in any previous experiences, then anyone can create their own reality. There is still so much more to discover. So much more to be born.